If you map out your entire customer service flow, and give team members clear guidance on how to handle different situations (including the tough ones that you can’t anticipate), then you can delegate customer service and keep it strong. A simple HelpDesk ticketing system that you can use to make sure you respond to customers that your team couldn’t help on chat – or that emailed your HelpDesk directly instead of speaking with chat. And a great team – but the above pieces matter more (even a great team will fail if you drop the ball on the above parts). When prospects are on your site, they’re going to have questions. You won’t be able to guess all of these questions, but you should know a lot of them in advance based on your experience in your business. For example, if you sell unbranded after market chargers for golf carts, people are going to need to know how to choose the right charger for their specific model cart. This is a question that you could definitely anticipate if you were in this business. What are potential questions your visitors would ask? What factors influence a decision between different product options? Clearly communicate the differences between between options. Do you have a really liberal return policy and guarantee if people usually buy this stuff offline? Address this concern so people feel comfortable buying online. What specifications do buyers think matter, but actually don’t once they research more about your products? Make this easy to understand on the website. Once you’ve identified what questions to answer on your site, it’s important that you make these easily available to customers at the right time. Make the FAQ section well categorized and easy to navigate, using internal links and expandable sections and questions. For FAQs that are related to specific products, include summaries on each product page and link to more detailed explanations within the FAQ section that visitors might be interested in. The key here is to make sure your FAQs are comprehensive, and that visitors can see them at the right time when the question pops into their head. No matter how well your website is designed, or how great your FAQs are, nothing is a substitute for a real live human being to help visitors with their questions. You probably already have a phone number people can call on your website, but only 5% of website visitors are going to buy or call you – the other 95% are going to leave (source: Advertise.com study). There are definitely great buyers in the 95% of people that leave, but you’re missing out because they don’t want to take the time to call you. Live chat provides answers to visitors right away. Visitors can click a single button to be connected with your team thru a text chat box, ask their questions, and get an answer right away. This is really low friction and low pressure for visitors, but really valuable since they’re getting real live human help (vs reading your FAQs). If someone is clicking back and forth between two different products, they’re probably trying to compare them. This is a great time to offer help. You can also appear if someone is on the checkout process, but then clicks the “shipping policies” page or something like that – they are interested in buying, but something about shipping is holding them back. You can address that on chat, and get them to complete their purchase. By having someone available to answer questions, you’re able to make sure visitors are well taken care with answers to their specific questions. If your team isn’t able to fully answer the visitors question on chat, you can create a ticket in your HelpDesk to collaborate with other employees to get an answer. Or if someone doesn’t chat at all and instead emails you, a ticket can be created. When someone chats with your team live on your website, ideally you should be able to get them an answer. But if you’re not able to, you can create a ticket in HelpScout. A ticket is also created if someone emails your directly instead of chatting on your website. 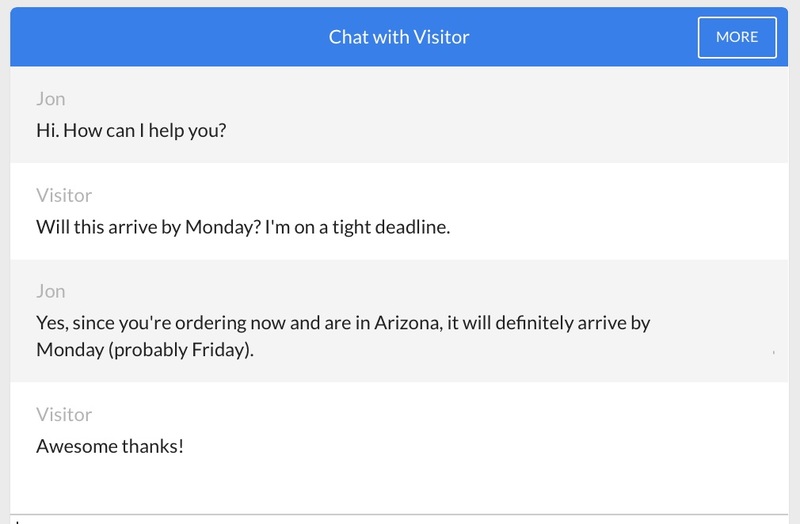 Team members can easily reply to the customer to answer their question, and the reply looks just like an email to the customer – no ticket #s, or donotreply@website.com email addresses like old school ticketing systems. The ticket has all the key info you need about the customer, including their contact information, their question and discussion with your team, internal notes between team members collaborating on the ticket, and even customer order history. Depending on the content in the ticket, you can automatically route the ticket to specific team members. For example, if someone a ticket said the words “sue you”, then you could automatically route that to you as the Owner so you can jump on it ; ) But this works well for returns, order status, or other post-sale questions you want your customer service team to handle too. If your team needs to collaborate to figure out how to solve the customer’s question, they can write internal notes back and forth on the ticket that the customer won’t see – this keeps things really organized for your team. Having a simple ticketing system in place for customer service is really important to make delegating customer service possible. The key reason you think you can’t delegate customer service is because there’s knowledge and experience you have in your head that your team doesn’t have (yet). You’re right that that can’t know everything you know – but you can help them understand what to do in 70-80% of customer service situations if you know how to structure your knowledge-base. Tag conversations, whether they’re on website chat or HelpDesk tickets, based on what type of question it is (i.e. ordering, returns, product information, etc.). Also, add a tag for “tier1” or “tier2”, where “tier1” is something you realize why handling the ticket that your team definitely should be able to handle. For example, “Where is my shipping tracking # for order #54321?”. Look back at the tags after a week or two to see what types of questions are the bulk of your work. Focus on delegating those first. Create a private Google Site for your customer service info, which is free, easy to setup, and easily searchable (it’s powered by Google – duh!). Create categories for each of the main types of questions you receive (i.e. Product Information, Order Status and Tracking, Payments and Returns, etc.). Create a page within each of the categories for the most popular questions visitors ask, link to the ticket(s) where you’ve answered that question in the past, and include a brief summary of why you answered in a specific way for each ticket. Your team will use this to decide how to handle different questions. They’ll simple search the knowledge base, find the resources you created and relevant tickets, and use that as guidance to answer the questions for you. But What If My Team Can’t Answer the Question? This will definitely happen, and the answer is simple – tell them how to assign the ticket to you! By having a simple “plan B” if they can’t find the answer, you can rely on your team for all the other questions and rest easy knowing that if they don’t know how to handle something there is a clear way for them to ask you for help. Tag it as “Supervisor Review” – so you can keep track in the future of the types of tickets that get escalated to you. Handle the ticket yourself, but add a quick note to the ticket explaining why you handled it in a certain way. And then create better resources for future questions like this so the system constantly gets better. This is where most business owners and managers get hung up and “can’t delegate this type of stuff”. If you have a way to escalate tickets, and focus on making the team’s resources better for future similar “tough questions”, then you’re able to delegate more and more as the weeks go by. The system, process, and tools mentioned above are most important. Even a great customer service professional will fail if you don’t give them the right guidance on how to handle different situations in your business. And you’ll be forever frustrated and unable to delegate. Have one team member dedicated solely to handling website live chat. If you just add it on to someone else’s job, it will be an interruption to them and they won’t be focused on chatting with as many visitors that need help as possible. You can add to this team over time. Have another team member responsible for the HelpDesk and handling most tickets. This team member is also responsible for routing tickets to other employees as needed if they need help. By having one person responsible for the HelpDesk, but everyone help, it will run smoothly (vs having everyone “handle tickets”). Empower your team with the right tools and comprehensive resources listed above so they can do their job really well. And make each team member responsible for updating the knowledge-base with new information when they see opportunities to make it more comprehensive. Give them a clear structure and process for updating the knowledge-base (and make your review a part of that process), but do not manage the entire knowledge-base yourself. “Woah…” Where Do I Start? Yes, this is a ton of information – but it is the “secret” to being able to effectively delegate customer service for your eCommerce store. 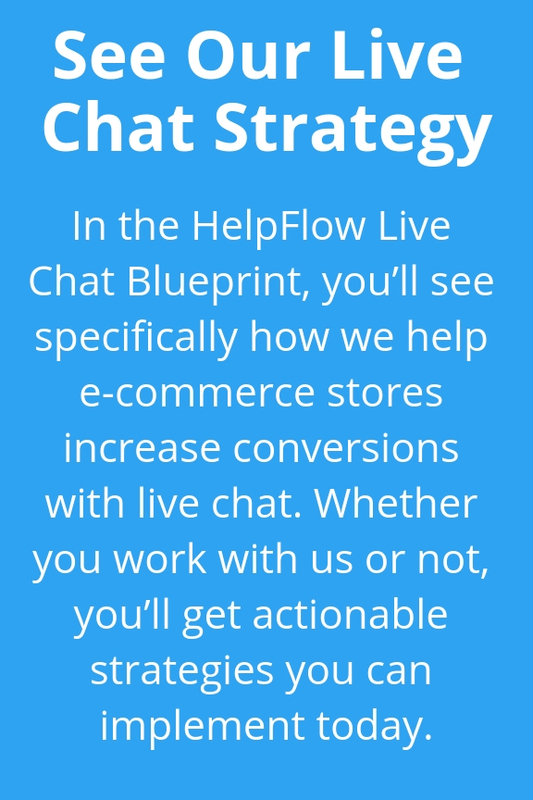 We can run your website chat system for you all day every day and answer your visitors questions – we already do this for a ton of eCommerce stores. We’ll create the knowledge-base together as part of chat service onboarding so we can use it on chats to help your visitors. It will be constantly added to over time. 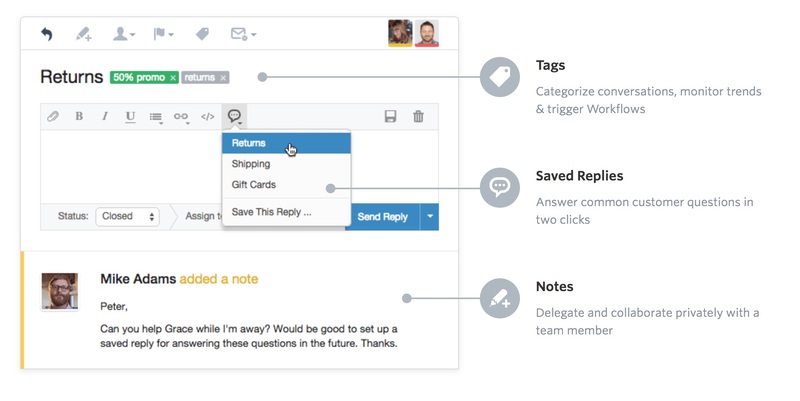 You can use this same knowledge-base as part of your team’s customer service work flow. We’ll share resources you can use to create a simple but effective HelpDesk system for your team, and understand the right workflow to use to manage that HelpDesk day to day. I have a question if we hire virtual marketing assistant for our chat services in ecommerce website (I’m willing to start one). Will that be a good option? Such an well explained post on handling the eCommerce customers! Sometimes people may get confused on how to deal with them in a professional but fruitful way, I guess everyone is gonna get help from this post. Thanks Alice. Happy you found it helpful. Great jobs! It is a beautiful and clear content about e-commerce. Thanks for share this helpful post. Thanks for the details post. I really enjoyed your post. Hope that it will be beneficial for professionals. I read your blogs on a regular basis. Your humoristic style is witty, keep it up! Thanks for your excellent post !!! This is really important to keep excellent customer support . Thank you. Extraordinary employments! It is a delightful and clear substance about web based business. A debt of gratitude is in order for share this supportive post.